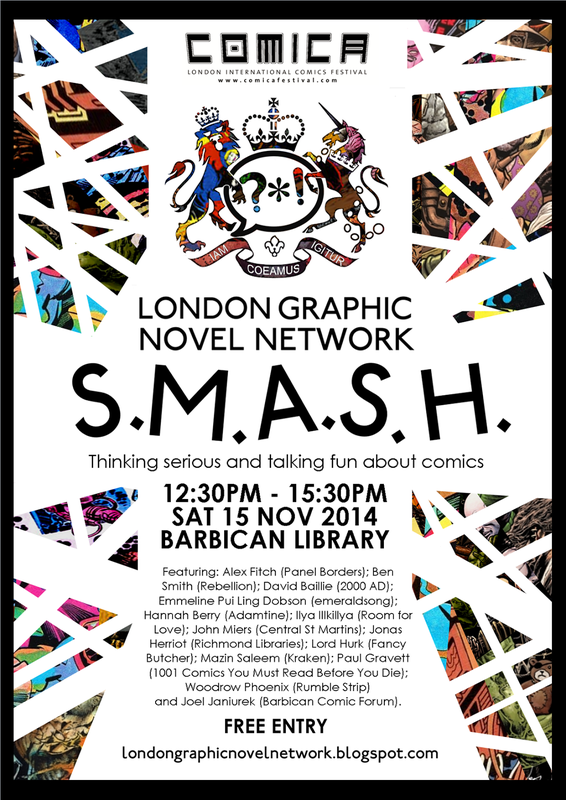 Comica and the London Graphic Novel Network present S.M.A.S.H. : thinking serious and talking fun about comics. For anyone curious to learn more about one of the most fascinating and underappreciated art-forms around. Join members of the London Graphic Novel Network (and others) as they discuss subjects such as Art, History and Storytelling and how they relate to the medium of comic books and graphic novels. Three questions. Three panels. A relaxing and informal chat followed by a discussion with the audience. ART: Where is the art in comic books? What’s so great about comics anyway? Where exactly are the pleasures that only comics can provide compared to other mediums such as film, theatre and literature? Why is there an intellectual and emotional edge that you only get when you combine words and pictures together? HISTORY: What is the history of comic books? Who are the unsung heroes of comics and which “classics” deserve to be forgotten? Which books have been most integral to the development of the medium today? And why should we even pay attention to old comics anyway? STORYTELLING: How important is storytelling to comics? Does it matter if the story is rubbish so long as the artwork is nice? Are there certain types of stories that only comics can tell or at least – tell best? And if so – why? Featuring: Alex Fitch (Panel Borders); Ben Smith (Rebellion); David Baillie (2000 AD); Emmeline Pui Ling Dobson (emeraldsong); Hannah Berry (Adamtine); Ilya Illkillya (Room for Love); John Miers (Central St Martins); Jonas Herriot (Richmond Libraries); Lord Hurk (Fancy Butcher); Mazin Saleem (Kraken); Paul Gravett (1001 Comics You Must Read Before You Die); Woodrow Phoenix (Rumble Strip) and Joel Janiurek (Barbican Comic Forum). Hi there. My name is Joel. For the past few years I’ve been running Comic Forums in various London Libraries. The Islington Comic Forum, Idea Store Comic Forum and the Barbican Comic Forum. They’re like a fun cross between a book group and a discussion group – only with the emphasis on comics instead of books. A whole bunch of us meet up and just kinda sit around talking about comics and art and stories and history and whatever else happens to crop up. Some of our conversations can get a little bit out there (I remember once we got on to the idea that maybe the Virgin Mary was like an asexual lizard) but that’s a big part of the fun. Part of the blame for this is that I did Philosophy at uni so I really like following an idea as far as it can go into all sorts of strange new and previously unguessed at places. Earlier this year a few friends and I started up something called the London Graphic Novel Network. The aim was to connect all of the Comic Forums and Graphic Novel Book Groups in London and everyone with an interest in reading comics. Lots of interesting things can happen when you bring people together (see the asexual Virgin Mary lizard above). It started off as an online type of thing where we all just emailed each other about a different book each week (we started off with The Sandman, but have also managed to do Fun Home and Halo Jones along the way) and now we thought we’d take it to the next level and do a big meet up type thing in the Barbican which for some stupid reason we decided to call S.M.A.S.H. The theory is: we round up some of our favourite comic creators and comic thinkers and get them all into the same room together and then inflict them with big crazy meaningful questions about Art (!) History (!!) and Storytelling (!!!) and then seeing where it takes us. I know that my own ideas about this sort of stuff are a little bit skewed to what most other people tend to think (if you’re interested then in brief: Comics aren’t “Art” – but that’s a big part of what makes them so much fun, Scott Pilgrim is the only comic you’d ever need and it’s not just comics – but everything is about storytelling: and if you don’t realise than then you’re sunk). Of course (of course!) the interesting part starts when we start to talk about this kind of stuff and discover the different opinions of other people and then we start to combine those ideas together – then we get all sorts of points that we never could have found by themselves. Or at least – that’s the plan. Of course it might all just end up in a shouting match over whether Batman could beat Superman in a fight (lolz). But yeah (sorry): more seriously – the aim of S.M.A.S.H. is to try and find a nice sweet spot between an intellectual academic kinda-thing and a fun irrelevant kinda messing around: like what we do in the Comic Forums only with more people joining in. So: if you’ve ever been curious about the link between Promethea and Calvin and Hobbes or wanted to talk more about why exactly Daniel Clowes is an evil genius or even if you just wanted to hear about how Alan Moore is completely over-rated then come and join us on Saturday November the 15th. We’d love to meet you.